Making lasagna can take a bit of time, but it provides dinner for at least a few nights . . . and it’s fantastic for a crowd! 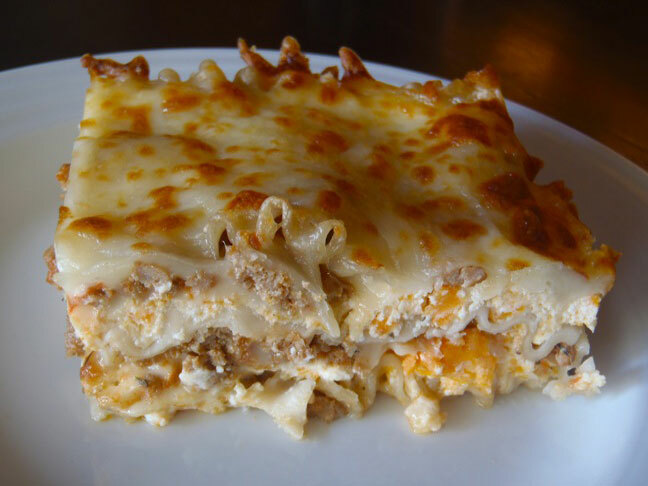 There are hundreds of different ingredients and flavors that can go into a lasagna. While this one was designed specifically for my kids, more “sophisticated” palates will love it, too. This lasagna isn’t too complex, and it offers a ton of sweetness and flavor. Yum! Preheat the oven to 375 degrees and cook the lasagna noodles in a large pot of boiling, salted water until just tender but still firm to bite, about 7 minutes. Drain well and separate the noodles, laying them flat on a plate or baking sheet. If lack of space means you have to layer them, drizzle a bit of olive oil between each noodle. Set aside. Coat a large saute pan with olive oil and cook the onion and garlic over medium heat until soft and slightly caramelized — they will be turning brown — about 7 minutes. Add the turkey and cook for about 10 minutes, stirring occasionally, breaking the meat into small pieces. Add the tomato puree, reduce the heat to low, and simmer to thicken the sauce, about 10 more minutes. Add the sugar and thyme and season generously with salt and pepper. While the sauce is simmering, you can make your yam puree. Simply poke holes in a medium-sized yam with a fork. Place it on a paper towel in the microwave and cook on high for about 2 minutes per side. Cut it in half to let it cool. Then you can easily scrape out the yam and use a fork to mash into a puree. In a medium-sized mixing bowl, combine the ricotta with 1 cup of the yam puree and season to taste generously with salt and pepper. Assemble the lasagna in a baking pan that’s approximately 9 X 13 X 2-inches. Spread about 1/2 cup of the sauce over the bottom of the pan. Add a layer of three noodles to cover the sauce. Then add a layer of the ricotta-yam mixture, followed by 1/2 of the sauce, and about a 1 cup sprinkling of the mozzarella cheese. Repeat this process. Then add a final layer of the noodles topped with the remaining mozzarella cheese. Bake in the preheated oven for about 20 minutes. If the top isn’t brown, place the pan under the broiler for about 30 seconds. Cover with foil and let the lasagna set for at least 20 minutes before cutting. To save some time you can find “no-boil” lasagna noodles at most markets. I use Tinkyada Pasta Joy, Organic Brown Rice Lasagna because it’s gluten-free (for my oldest son who has Celiac Disease) — and it’s wonderful! You can find it at Whole Foods. For me, lasagna is always even better the next day!